February is one of those months that are nice in a very understated way. The new year has settled in, there are no great celebrations or festivals, no birthdays or anniversaries also for us, yet it’s short and sweet and just nice. For me this has been a happy month full of books and reading, some successful kitchen experiments and lots of love from family, both real and virtual. Oops did I just say there are no celebrations? Well that wasn’t quite true. In fact we began the month with one because February 1st was World Read Aloud Day. I rounded up a handful of children from our apartment complex and organised a read-aloud session. We sat around a table, eating biscuits, reading out portions from favourite books and reciting poems. We followed it up with word games and the children went a little crazy, happy crazy, that is. The best kind of crazy, right?We had so much fun that I’ve promised myself that I’ll do it better next year with a little more planning. While on books and reading, this year I resolved to buy fewer books so I could make my way through my burgeoning unread collection at home. As the resolution fervour wore off and I was beginning to feel sorry for myself (even though I had no right to) the Universe stepped in and two brand new books arrived at my doorstep. They were from my dear blogger friend Soumya. She wrote me the sweetest message that absolutely made my day. A just-like-that gift really is the best kind of gift. And if it’s books it’s even better. Then Shantala from Shanaya Tales hosted a giveaway and I won it and Becoming by Michelle Obama came home. This was one book I was really looking forward to reading. I’m half way through it and I’m loving it. The other happiness was the discovery of a book cafe close home. It’s the most delightful little place with stacks of books that one can read over a cup of elaichi chai or a bowl of maggi. I’m looking forward to spending some happy hours there. I did a fair bit of cooking thanks to Rachna’s blog. It has become my go-to place for recipes. I tried Gajar ka halwa and it turned out so well that I made it again and then again. I have now locked it up safely in my list of ‘Fool proof recipes I can successfully replicate’ along with a small handful of others. Then I tried stir-fry broccoli which also turned out to be a no-brainer. The children have been in a happier space this month. H’s allergies, which he has been struggling with for over a year, seemed to have taken a break. He has been sleeping better after ages. He hasn’t ever been too sound a sleeper but it reached crazy proportions over the last year. Nothing seemed to work. He has no access to gadgets during weekdays, not even television. On the odd day that we do watch TV, it’s not much. And yet he has difficulty falling asleep and wakes up a number of times at night. We tried to get him to read before he sleeps, tried massaging his feet, tried warm milk and jaiphal – everything that anyone suggested – but it wasn’t much use. I’ve been toying with the idea of consulting a homeopath. Maybe after the exams I’ll do that. Yup, exams are round the corner and we’re gearing up for them. The maid has announced a week’s leave, N has a new idea for a novel and plans for the after exam-party are underway. Yeah, that’s how we gear up. I’m late again, as always for the gratitude post. But since that’s all I seem to be writing about these days I’m grateful I do get to them. October was a good month, apart from a few hiccups. Without dwelling upon the hiccups, let me just get to the good bits, for there were quite a few. Exams ended for the children around mid-October and I loved the relaxed pace of the days that followed. We watched films together and listened to music. They always protest when I put on music from the 60s and 70s, my favourites from RD Burman, Kishore Kumar and Shammi Kapoor as also The Beatles and Cliff Richards. On the other hand I struggle to enjoy theirs which seems noisy to my old (y)ears. This time round we struck a happy compromise. They were patient as I introduced them to the beauty of the lyrics and the melody that I loved. It was rewarding to hear them humming ‘Jab zero diya mere bharat ne’, a personal favourite. I too found I enjoyed some of ‘their’ songs and many of them now have a permanent place on my walking playlist. The music went well with the mindfulness month initiated by Modern Gypsy.. Though I couldn’t keep up with posting daily pictures, I did become more conscious of the small bits of time, of togetherness as well of alone-time and I learnt to enjoy them both. I chatted with the kids while we walked to their classes rather than hurrying there and back. We took impromptu breaks together and stopped at roadside restaurants for nachos or fries. The children decided to surprise me one weekend by cooking up breakfast. They made out a rather elaborate (and unusual) menu card. N handled the kitchen and H played the maitre d with frequent prompting from her. The tea was too strong and the tomatoes in the omelette cut too large, yet it was the best breakfast ever. My reading slowed down a bit but no regrets there. On a happy note I won not one, not two but three giveaways – that’s two books and a gorgeous tumbler set from Harper Collins. I’ve already put the tumblers to good use and am hoping to have the reviews of the books up on my other blog soon. Genghis Khan proved to be a very engaging read. Still to begin on The Invincible Weapon. The children are on a two-week break and it’s good to have them home without the pressure of having to push them to study. H is a borderline gaming addict, which is a constant source of struggle between us. Our daily arguments notwithstanding, he is now planning to start a YouTube channel on gaming tips and tricks and wants my help. I’m wondering whether that is wise at all, even if I had the tech savviness to help him, which I don’t. I do think that making those videos would be better than the actual gaming – at least it will involve a degree of creativity. N dabbles in a hundred things. Currently she seems to be enjoying writing. I love finding creative prompts for her. To see her sitting at the table scribbling away makes my day. Also, since I mentioned this, there’s something I’d like your advice on. She currently writes with pen and paper. However, I was wondering if I should get her to switch to a tab. Editing and correcting on paper is tedious for me and she hates to re-write. Besides, the tab is certainly going to be the future of writing, of that I’m certain. However, I’m a little conflicted about her giving up the traditional pen and paper. So help me here, should I get her to switch at least for leisure writing? Or is it too early? That’s it from me. November is treating me well and my gratitude list is already pretty long. PS: I took to an adult colouring book and that post header backdrop was done by me. It made me quite happy. It’s been almost a month since I blogged here. It seems much much longer though, as if it’s been ages since I spoke to friends. I haven’t been in a speak-out-my-heart kind of space this last month. And since that’s the only way I can write at obsessivemom, no writing got done. However, the once a month gratitude post needs to be written and so here I am. No matter that this one is for August and we’re already in the second half of September. No matter. The two things that saw me through this month were exercise and books. The biggest win was on the fitness front. I finally managed to find a rhythm for my exercise routine. I planned to stick to a forty-five minute walk but the rain gods played spoil sport. That ended up being a blessing in disguise because I discovered Leslie Sanson’s walk videos on YouTube. I took a while to get used to them. But so desperate was I and so frustrated with the rains that I started off from the better-than-nothing place. Now I’ve explored and tried out several of them and they’ve become a regular part of my fitness schedule. I do still try to step out for a walk but the days I cannot, I follow the videos. These are 15 minute videos of varying intensity that take you through a one mile walk. I usually take up three of them in a row which adds up to 4.8 kms and that’s good enough for me. I love that I can exercise any time of the day and also that I can do so in my pyjamas. If you’re starting off on an exercise routine I highly recommend them. If you’ve been exercising for a while you might find them too easy and you might want to explore the more intense ones. The second win of the month was reading. I read. A lot. While writing has been at an all time low, reading has been an all-time high. Early last month I went to a books by weight sale. Each time I go to one I feel like a child let lose in a candy store. I picked up over a dozen books at a throwaway price. And have, since then been on a reading roll. I have found that books are a great way to distract oneself, to keep oneself happily engaged. Also, reading has helped me cut down on social media time-pass and sleep better. I’ve been blogging fairly regularly on my book blog as well as at Goodreads, so it’s not been too bad. September is half done. The children’s exams are up in another ten days and I’m caught in my usual struggles. It’s going to be an eventful month, whatever is left of it. Yet again grateful for Vidya’s Gratitude Circle that reminds me of all the good things in my life. February seemed to drag on and on forever but now that I’m trying to recap the month it seems to have flown past. It’s been very busy and yet uneventful. I think that’s a good thing. I like ‘busy and uneventful’. I’ve been much more relaxed this month than I’ve been in a long time. If I were to name one thing I was specially grateful for this month, it would be health. The recent passing away of well-known actor Sridevi brought home the fact ever more strongly. It breaks my heart to think what her teenaged daughters would be going through, perhaps because I imagine my children in that same situation, should anything happen to me, and the thought frightens me. It’s morbid, I know. However it does put things in perspective. Going forward from that thought, the biggest happiness of the month was that I could finally get my tests done. I spent a good five hours at the hospital giving all kinds of samples, and standing/lying down under machines of all shapes and sizes followed by multiple visits for some more investigations and consultations. Finally, I have been pronounced reasonably healthy. Whatever little blips I have can all be corrected with supplements. The best bit was that the heart was in its place and pumping happily along. But then I always knew that :-). There’s of course the old enemy, fat, to contend with. But I’m on it and I’m glad to report that I’ve managed to begin the evening walks I’d been planning for ages in addition to my morning routine. They’re short ones, just about twenty minutes, and only on weekdays. It was a bit of a shocker to realise how I’ve lost stamina. There was a time I was walking 7-8kms and now I tire in 2. The speed is pretty pathetic too. After the first few days I did away with all walking apps because the figures were just so abysmally depressing, specially when I compared them to what I could once do. Now I just have a timer and am concentrating on walking a minimum of 20 minutes everyday. The speed and the stamina will have to wait. 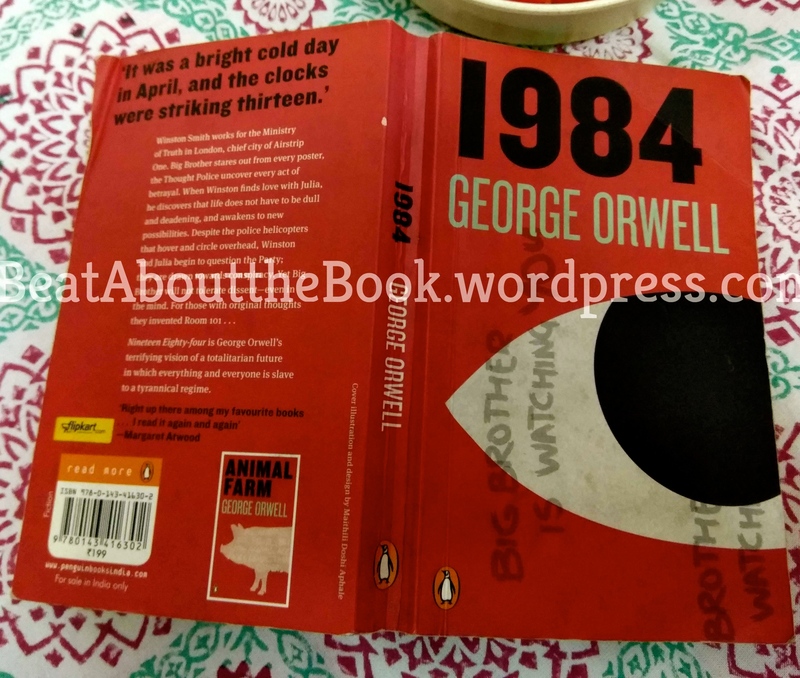 This month a few blogger friends decided to exchange pre-owned books from their personal collections – a fabulous idea conceived and coordinated by Shalini who blogs at www.shalzmojo.in. I received Big Little Lies from fellow bibliophile, Lata and although I still have to review it on my other blog, I will reiterate that it turned out a wonderful read. A good book stays with you for a long long time and this one shall too. If you haven’t read it, do pick it up. Sometimes I worry that most of my moods, my happiness and my stress, stem from the children. It’s not healthy, I know. I am depending on time to change that. Or perhaps once the Husband is around more often the pressure shall ease off. Early this month they went on a day-trip to an amusement park out of town. I’m grateful they came back safe and sound and also that I could take this small step towards letting go. Much as I enjoy my alone time, the happy moments with them are absolutely priceless. I organised a surprise lunch for them on Valentine’s Day and their excitement was a treat to watch. N made some very mushy cards for me while H had a huge hug to offer. A week later, we went out for dinner. That was a bit of an event because with the Husband away we keep putting off going out for when ‘papa is here’ and things tend to turn a little dull. But one Saturday we all dressed up and went out and it was great fun. I must remember to do it more often. Apart from the lunches and dinners their everyday laughter and total goofiness never fails to lift my spirits. The other day, the maid went on uninformed leave and as I was getting dinner together bubbling with annoyance H walked into the kitchen, a tulip clutched between his teeth (not a rose and not even a real tulip, for that matter) doing the classic MJ pelvis shake. It would have been absolutely gross had it not been so very ridiculous. And every shed of my annoyance was chased away by the riot of laughter. It is moments like these that keep me going.